For dreamy beaches, fascinating history and exciting water-sports, look no further than the African island of Zanzibar. If you’re going backpacking in Zanzibar and you’re on a budget, here are all the best things to do in Zanzibar. The funny thing about arriving on the island from Dar Es Salaam on mainland Tanzania is you need to go through customs and show your passport, even though Zanzibar is included under the Tanzania visa. After centuries of colonisation by the Europeans and Arabs, Zanzibar was named an independent country in 1963. 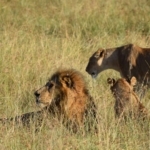 It merged with its neighbouring mainland region – then known as Tanganyika – to form the United Republic of Tanzania, but the island retains a semi-autonomous status, hence the border control. 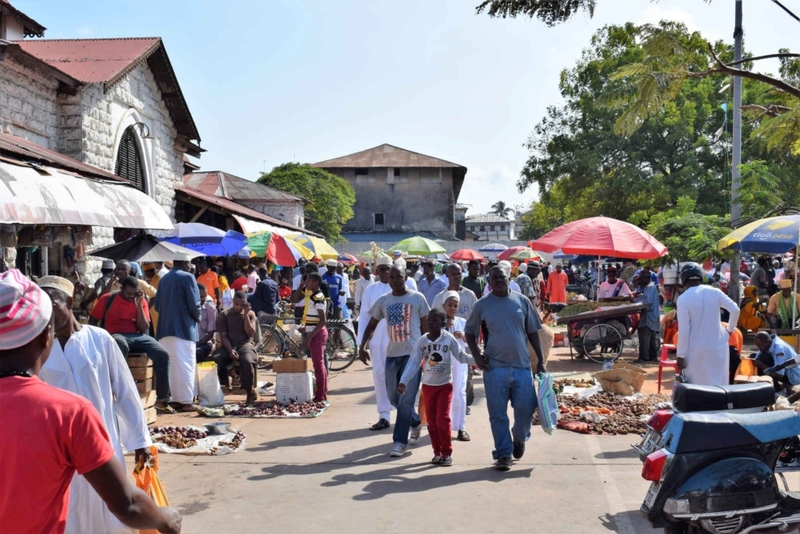 We headed straight for Zanzibar’s historic centre of Stone Town. Its architecture is a fascinating visual reminder of the island’s diverse background, from its native Swahili culture to Arab, Persian, Indian, Portuguese, German and British influences. The town became a UNESCO World Heritage Site in 2000. 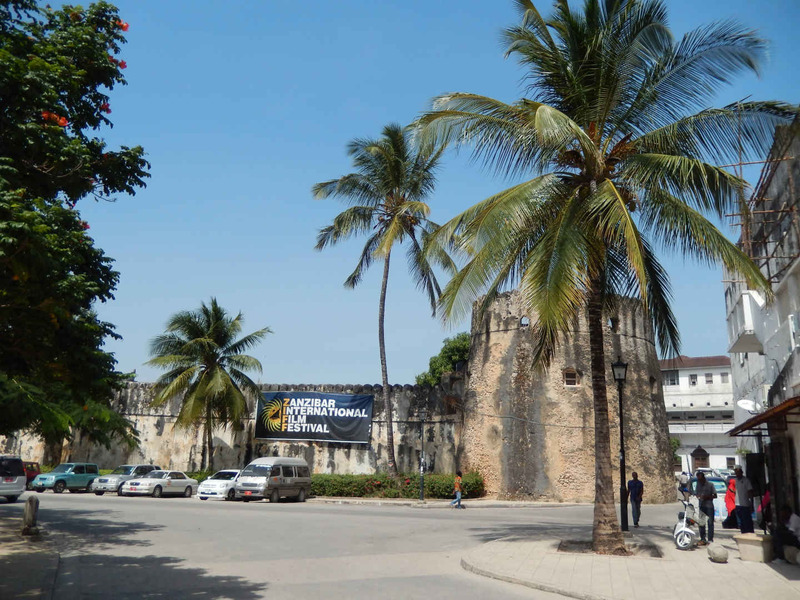 Zanzibar’s Old Fort was built in late 17th century by the ruling Sultanate of Oman to defend the island from the Portuguese. Today it hosts the Zanzibar International Film Festival. 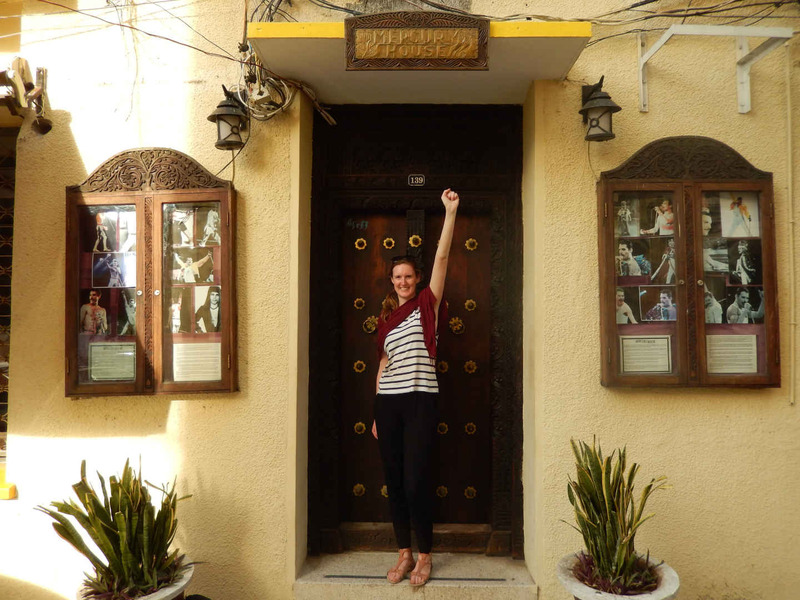 Simply walking around Stone Town is the perfect way to start your Zanzibar backpacking trip. One of my favourite facts about Stone Town is it’s where the late, great Queen frontman Freddie Mercury was born, on 5 September 1946. Here I am outside Mercury House, the rockstar’s birthplace. I was surprised that there wasn’t any kind of museum for Freddie – inside the building is now a tourist gift shop. His parents moved to the island for his father’s work as a cashier at the British Colonial Office, while the island was still a British protectorate. After a hot day exploring Stone Town, every Zanzibar backpacker needs rest and refreshment. 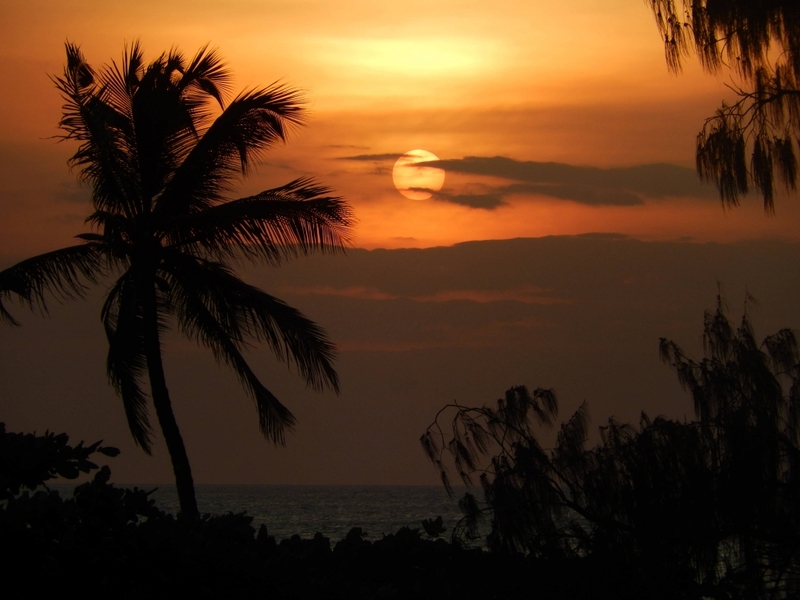 Where better to enjoy a cool drink than at a bar where you can watch the sunset? In the evening we went for cocktails at the Sunset Bar of the Africa House Hotel, which lived up to its name, with a beautiful view as the sun went down. The next day, we visited some of Stone Town’s historic sites, including the 19th century Anglican cathedral of Christ Church. 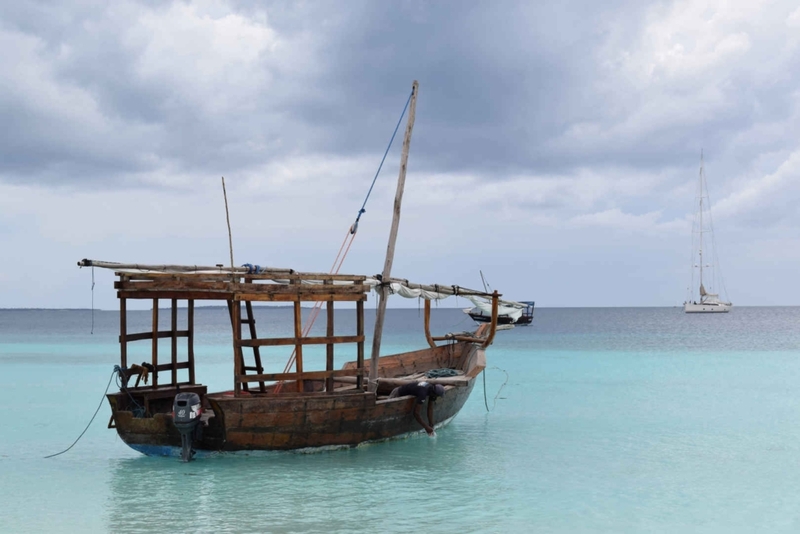 Of all the island’s things to do, Zanzibar’s dark history is perhaps the most important. 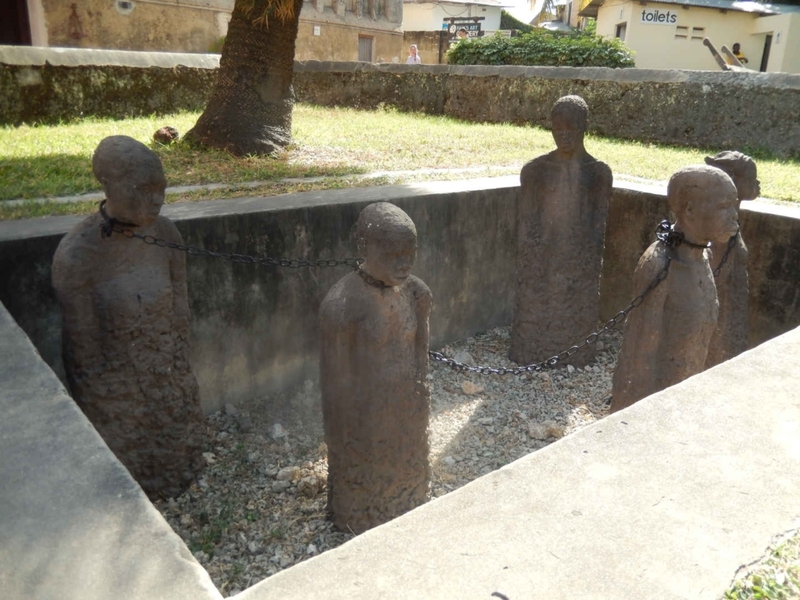 Built on the former site of the island’s biggest slave market, it serves as a monument to mark the end of slavery. Here there is a museum, including the horrifyingly cramped low-ceilinged rooms where dozens of people were kept chained, as well as a memorial to the slaves outside. For the intrepid backpacker, Zanzibar must-dos include browsing the island’s markets. We stopped to visit the Darajani Bazaar, a bustling market selling enormous fish, slippery seafood, shiny vegetables and Zanzibar’s famous spices. The meat section of the indoor market area, slightly worryingly, was all displayed unrefrigerated in the open air, with flies dancing across the carcasses. After a visit to one of Stone Town’s famous spice gardens, we headed north to Nungwi for some beach life and Zanzibar scuba diving action. 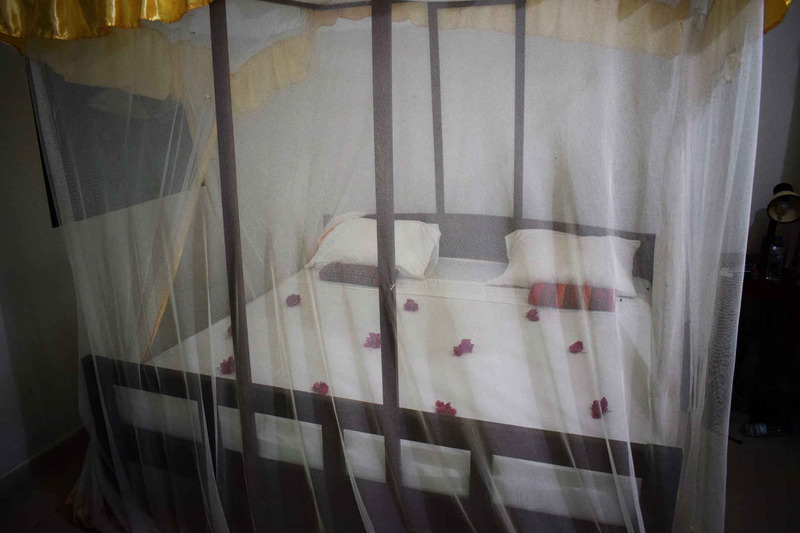 A good mid-range option is the Nungwi Inn, with its cute four poster beds. Ideal for sharing, it costs £58 per night. 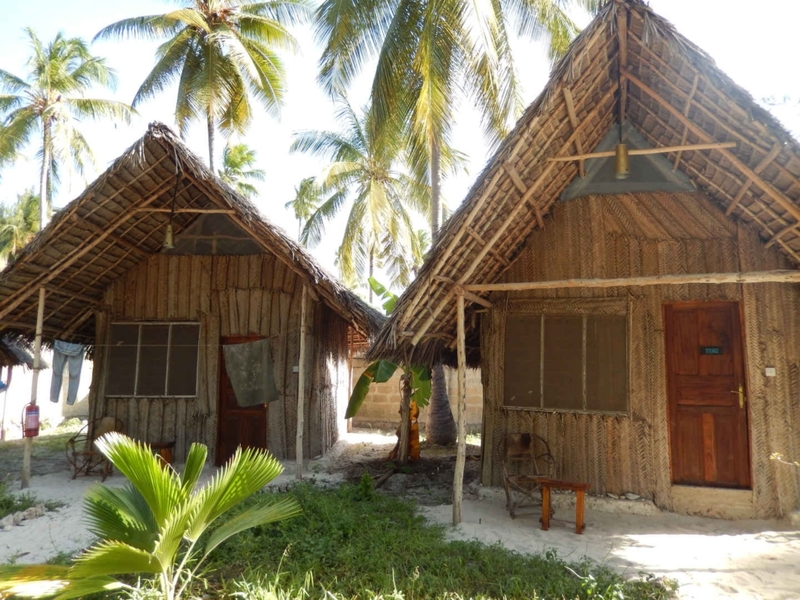 To browse and book budget accommodation for solo Nungwi backpackers click here. 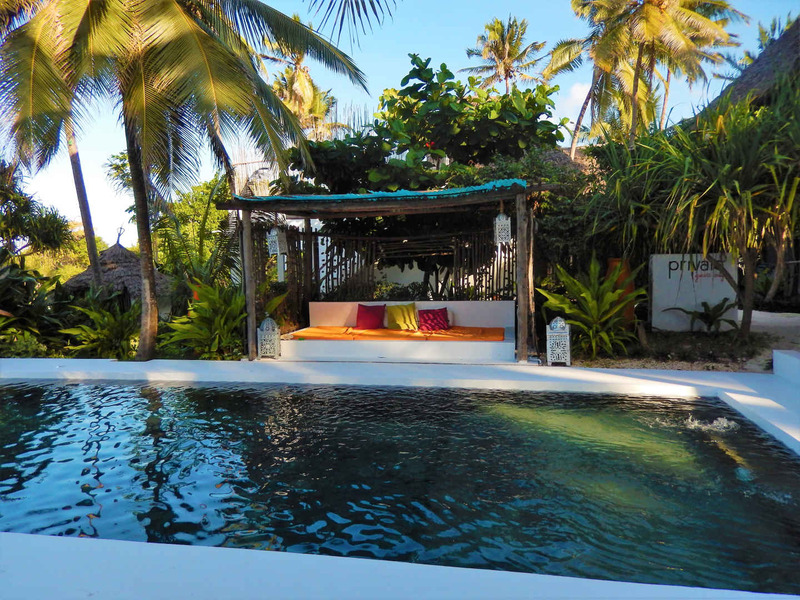 This small and quiet area is home to a scuba diving Zanzibar centre, Spanish Dancer Divers. Here at this 5-star PADI Nungwi diving resort, I decided to dip my toe back into scuba diving after a year or two’s hiatus. 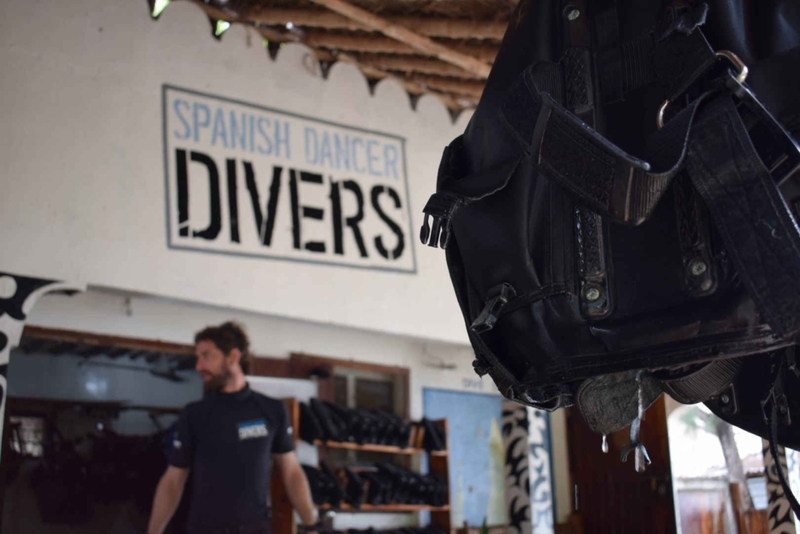 Our Zanzibar diving group was a motley crew, ranging from a 19 year old lad who had never dived before to a remarkable 78 year old lady who joked that her dive card was so ancient that no-one would even recognise it any more. The Spanish Dancer diving Nungwi crew was accommodating, organising an introductory session for the young lad and refresher sessions for the rest of us. Their dive Zanzibar team made sure the older lady was comfortable and ready to go. Our friendly dive instructor kitted us up with our wet suit and scuba gear. They even arranged an on-board breakfast as it would be an early start. Our scuba Zanzibar team headed to the Mnemba Atoll Conservation area, a seven by four kilometre reef with good visibility, containing the tiny Mnemba Island. We saw fluttering shoals of bright fish, stripy characters lingering among the anemone and amazing fish showing-off their big spiky displays. 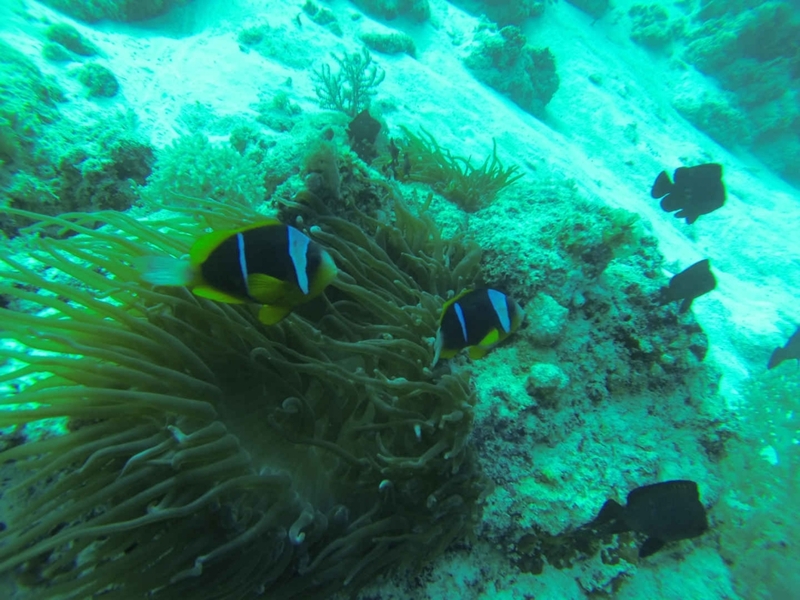 Diving in Zanzibar is well worth a try. 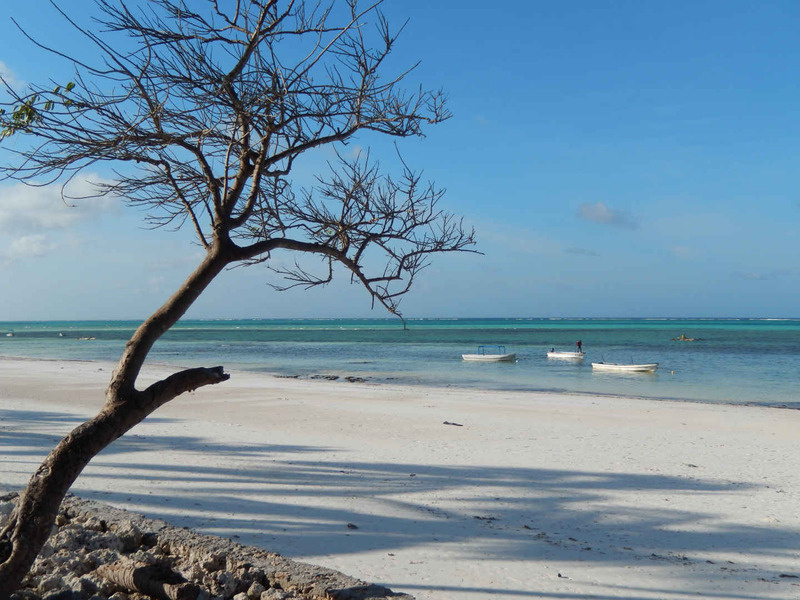 Our next stop was a beach I’d heard a lot about, as it offers plenty of stuff to do in Zanzibar. Paje is home to wide, white and windy sandy beaches. Despite the many kitesurfers taking advantage of Paje’s ideal conditions, a short stroll will uncover beautiful beaches with hardly a soul on them. During the day, you can wander around the villages behind the tourist resorts to find the local shops and bargain for a handmade souvenir or two, or grab a table in one of the beachfront bars and restaurants. At night, the area is known for its parties. We went to one at Jambo bar and danced until the early hours. 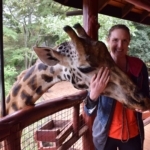 Don’t be surprised to see men wearing Maasai warrior robes hanging out at the parties too, as these parties are enjoyed by tourists and locals alike. Our home for the next few days was the fabulously relaxing New Teddy’s Place, just a few steps from the beach. 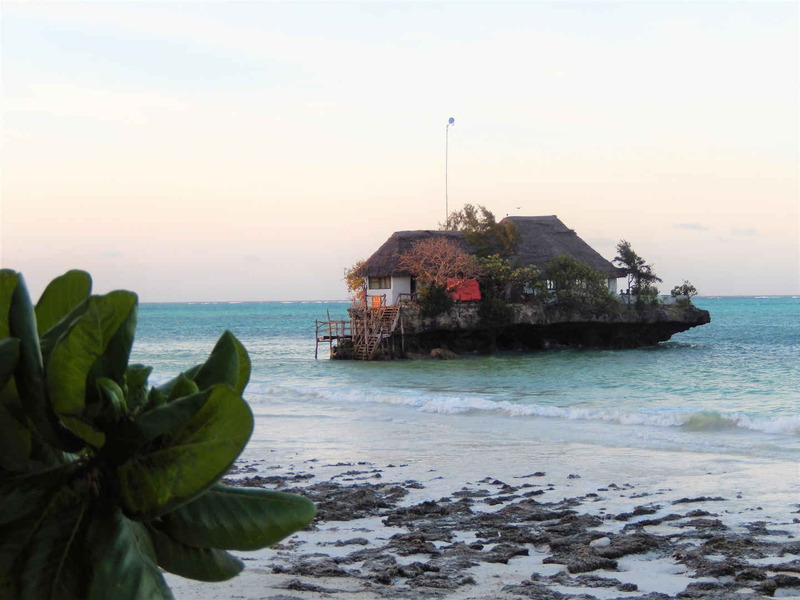 With its rustic cabins, hammocks and chilled vibe, it’s the perfect place for backpackers, Zanzibar-style. The staff here are friendly and the daily menu is divine. From Teddy’s we took a taxi to Pingwe beach. Here we browsed in cute trinket shops and put up our feet with a cocktail in the decadent Upendo beachfront pool resort. 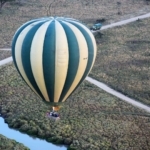 Upendo means ‘love’ in Swahili and we certainly had a crush on this place. The reason for our trip here was a restaurant called The Rock, which is located on, well, a rock in the middle of the sea. At dusk it was high tide so we caught a small fishing boat to access this unique restaurant. This is a unique and cool experience for Zanzibar backpackers wanting a dining experience with a difference. Inside it was romantic with candlelit tables and we feasted on lobster and pasta. At one point we ventured onto the restaurant’s sea-facing deck for a drink. It felt like a special occasion and a wonderful way to wrap up our backpacking Zanzibar trip.